Maysa’s unique, instantly identifiable vocal sound encompasses both Jazz and R&B. The Grammy-nominated Soul/Jazz recording artist was born and raised Maysa Leak in Baltimore, Maryland, and knew early on that she would be a musician. “I was six years old when my mom took me to see Purlie,” she recalls. “When Melba Moore came on stage and sang her heart out, I knew at that moment I wanted to make people feel the way she made me feel.” Maysa’s journey took her from singing upon graduation with Stevie Wonder for a year to becoming the lead singer for Incognito in the 90s. In 1995 she recorded her first solo album and she’s recorded 13 in all. Her most recent critically acclaimed album, Love is a Battlefield, will receive the 2019 Album of the Year from the Black Women in Jazz & The Arts Awards Association, which will also award Maysa the 2019 Vocalist of the Year. 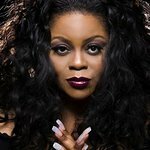 Maysa will be featured in a 2019 episode of Indie Soul Journeys, a TV series devoted to the inspirational and intensely personal stories of the independent R&B/Soul artists still keeping various Black Music traditions alive in today’s modern music era (initially airing on PBS Chicago, prior to national distribution). We don't have any videos related to Maysa.